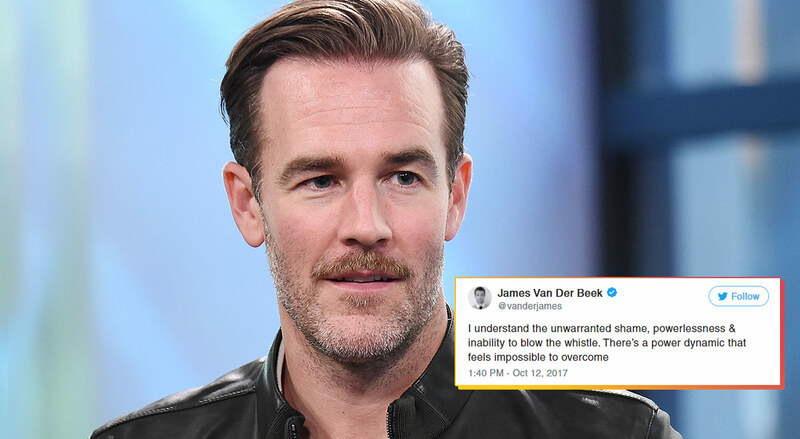 Following reports and allegations of sexual misconduct from studio executive Harvey Weinstein, Dawson’s Creek star James Van Der Beek has come forward with his own experience of assault from powerful men in Hollywood. Initially, he commented on the Weinstein scandal with the following tweet. He then went on to condemn Weinstein, saying that "What Weinstein is being accused of is criminal. What he's admitted to is unacceptable—in any industry. I applaud everybody speaking out." After his tweets gained traction, he clarified that the people he was talking about "99.9% of you don't know. Two were charged (by others) and punished. The other has since died." His comments come in the wake of certain corners of the internet being judgmental about why the women who accuse men of inappropriate behavior don't come forward sooner. They also come in the wake of a Twitter thread from Terry Crews, who accused an unnamed Hollywood male of groping him, proving this isn't an exclusively female problem. Many celebrities, including Cara Delevingne, Angelina Jolie, and Gwyneth Paltrow have come forward to accuse Weinstein in particular, but this incident has created a social media flurry of celebrities speaking out about other incidents of assault, as well. Van Der Beek may not be the last.